Intelligence tests, like the OLSAT (Otis-Lennon School Ability Test), are used by many school districts to qualify children for their gifted and talented programs. OLSAT is a multiple choice test that assesses verbal, nonverbal, pictures, figures, and quantitative reasoning questions to measure your child’s overall ability–and often eligibility for his or her school’s gifted and talented program. The OLSAT is administered to children, Kindergarten through 12th grade, and is useful in showing how well your child comprehends and uses reasoning in a wide variety of applications. The test itself is comprised of 21 different types of verbal and nonverbal questions and is designed to assess performance across a wide variety of reasoning skill sets. Did your child guess the correct answer? For these types of questions a good skill to teach your child is eliminating the answers that are incorrect. For instance, in the above example your child might immediately deduct that the events are not occurring in the summer time due to the clothing. What other ones might he or she deduct? Perhaps they might recognize that the boy in the story has a fever after she took his temperature, because the mom has a sad expression and is calling the doctor’s office, so it is likely that the boy is not out sledding in the last frame of this story. That leaves the final two choices…and one choice (d) is a duplicate of the first picture. So that means the answer is b! How Should My Child Practice for the OLSAT? LISTEN: Remind your child to listen carefully. This is especially important for sentence completion questions, where the teacher will read the question prompt once — the question cannot be read twice. LOOK: Teach your child to look at every answer choice. Consider every answer choice one at a time; then pick the best one. Sometimes, more than 1 answer will seem right. Other times, no answer seems ideal. Pick the best answer of the possibilities offered. GUESS: Always guess. If you aren’t sure, eliminate answers that are definitely wrong and then take your best guess (like in the sample question above). There is no penalty for guessing. PRACTICE: Practice filling in bubbles (for children K and above. Pre-K only need to point to answer). Be sure to practice filling in bubbles completely and using the bubble sheet. What is the format for OLSAT? The OLSAT test takes 50-60 minutes for your child to complete. Although, the test may take a little longer for lower grade levels, since the teacher will be reading the questions. For younger children, Pre-K – 1st Grade, the OLSAT is often given one-on-one. Older children typically take the test in a group setting. Guessing incorrectly on the OLSAT test gives the same score as leaving the question blank, so have your child answer (and yes, even if it is a guess!) them all. Question types are staggered, meaning difficult questions are immediately followed by easier ones and vice-versa, to prevent a child from being discouraged by tough OLSAT test questions at the end of test sections. 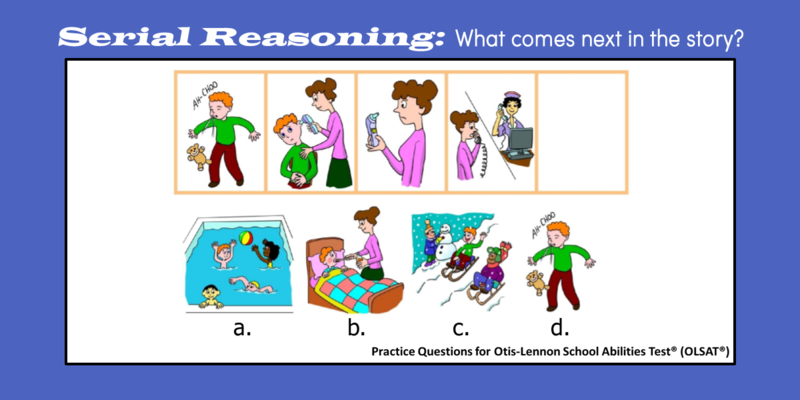 Here are a couple of OLSAT practice questions to get your child started. Look at first box of numbers. In the boxes that follow, choose the box where the 1 and the 3 switched places with the 2 and the 4. Look at the shapes in the boxes across the rows and up and down the columns. Do you see how they are related to each other? Can you find the answer that goes in the empty box so the designs inside the rows and columns follow a pattern or rule?